+Excellent size and frame for an NFL quarterback – legit 6’3?. Recently emerging on some draft boards as the top quarterback prospect in this 2013 NFL Draft class, Geno Smith out of West Virginia has the size, arm strength, and athleticism that the NFL now wants from their quarterbacks. The 6-3, 220 lb star plays in a shotgun spread offense with the Mountaineers. There will be a slight learning curve when transitioning to a pro-style NFL offense. Even with his above-average athleticism, Smith has been a pocket passer throughout his career. A very confident player, Smith is not afraid of big plays and tough throws. He should grow into a natural leader, but that said, he already shows poise and a determination when on the field. One area of concern is his accuracy; the former Miami native needs to learn how to put some touch on his throws on occasion. He has a tendency to always rifle the football, which can lead to a lack of precision on short throws. He delivers a great deep ball with consistent accuracy when given time to set his feet. When moving to his left or right, Smith will have to learn to not rely solely on arm strength and use his whole body to make throws. Arm strength is not a question. Looking ahead to the 2013 NFL Draft, Smith’s stock has risen significantly. He may be a potential No. 1 pick. “Smith, possessing a legitimate NFL combination of size, mobility and arm strength, completed over 65% of his passes over the 2010-11 seasons, throwing for a combined 55 touchdowns against only 14 interceptions. “He appeared to be a shoo-in for the Heisman Trophy during a red-hot start to 2012, but then ran into significant issues in blowout losses to Texas Tech and Kansas State. “Over the first five games (five wins), he completed 81.4% of his passes with an astonishing 24-to-0 TD-to-INT ratio. Then, against Texas Tech and K-State, Smith had just a 57.5% completions and two touchdowns, along with his first two interceptions of the season. “In those two games, the opposing offenses jumped out to big leads and Smith struggled to rally his team and answer with the big plays that wowed us earlier this season. Against the Wildcats, he appeared hesitant and a tad gun-shy with his longest completion going for just 13 yards. 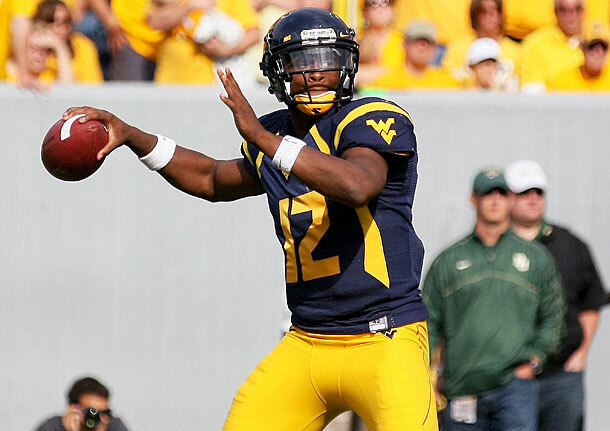 Be the first to comment on "49ers Gab 2013 NFL Draft Scouting Report: West Virginia QB Geno Smith"